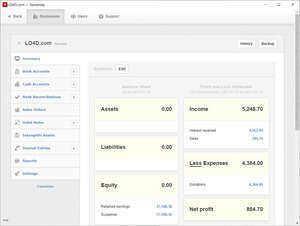 Manager is free accounting software that runs on Windows, Mac and Ubuntu. It features an intuitive and innovative user interface with modules such as cashbook, invoicing, receivables, payable, taxes and comprehensive financial reports. For your convenience, Manager has been designed to be very easy to work with. The program is so intuitive, you will be up and running in no time without studying any documentation whatsoever. Version 19.2.85 is a freeware program which does not have restrictions and it's free so it doesn't cost anything. For security reasons, you should also check out the Manager download at LO4D.com which includes virus and malware tests. Additional screenshots of this application download may be available, too.